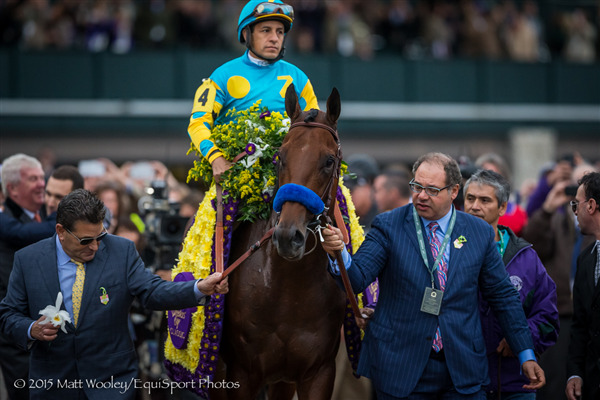 Zayat Stables, which campaigned 2015 Triple Crown winner and Horse of the Year American Pharoah and won Eclipse Awards as outstanding owner and breeder of the year, has engaged an investment banker to raise up to $300 million to expand its bloodstock holdings and launch a new veterinary services company in North America. Piper Jaffray, founded in 1895 and headquartered in Minneapolis, Minn., has prepared a four-page “investment opportunity” brochure detailing Zayat Stables' past accomplishments and future plans for the capital it intends to raise. Launched in 2005 by New Jersey businessman Ahmed Zayat, Zayat Stables has “pioneered a disruptive business model that has created the #1 brand in the horse racing business,” the brochure states. The document features some of the stables successes, including American Pharoah, which it lists as having a “sale value” of $35 million as a stallion and estimated market value of $100 million. Other stallions listed are Pioneerof the Nile ($6 million sale value/estimated market value of $43 million); Zensational ($11.5 million sale value/$6 million estimated market value); Eskendereya ($10 million sale value/$9.5 million estimated market value); Bodemeister ($13.3 million sale value/$15 million estimated market value) and Paynter ($9.5 million sale value/$10 million estimated market value). Piper Jaffray has been engaged to raise $75 million to $100 million for “initial use” (to be divided equally for acquisition of racing/breeding assets and vet services assets) and a total of $200 million to $300 million for “near term use.” It projects year five revenue of $554 million and EBITDA of $240 million and says Zayat Stables earned $10 million in EBITDA in 2015 on $24 million in revenue. Zayat Stables, which has twice been North America's leading money-winning Thoroughbred owner and among the top 10 in six of the last nine years, reorganized under Chapter 11 bankruptcy in 2010, agreeing to pay off its creditors in full over a four-year period.